OM121 OBD2 scanner is an ideal choice for the DIYER who looking to learn a little more about his car or truck inner workings. Although It's a small OBD II reader, it does all the basic functions. This basic obd ii scan tool can read out and also delete generic OBD2 trouble codes. If you are a car technician, you will urgently need this tool to assist you to find the fault. 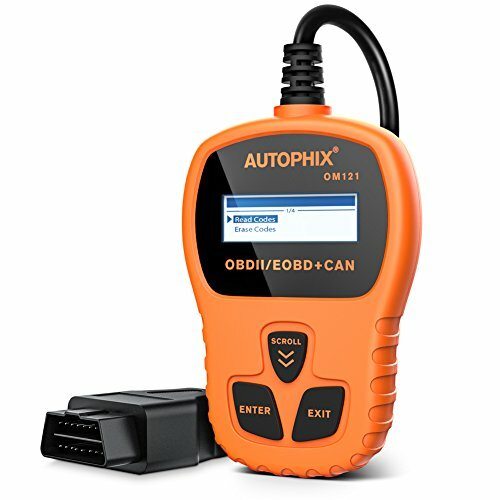 Autophix present you with the best auto diagnostic scanner which will help you save money and accurately diagnose any car problem. Turns off check Engine light, clear codes and resets monitors. Works on 1996 and newer US-Built, EU-Built and Asian-Built OBD2 vehicles. Supports CAN(Controller Area Network), J1850 PWM, J1850 VPW, ISO9141 and KWP2000 protocols. External Power: 8.0 to 18.0V power provided via vehicle battery. OM121 code reader will not work on some special cars. Contact us to know if the code reader protocol is compatible with your car. OBDII vehicle diagnostic code reader works on 1996 and newer US-Built, EU-Built and Asian-Built OBD2 vehicles. The car fixed diagnostic scanner reads hard (memory) /pending (intermittent) and historic codes accurately and shows the DTC definitions in multiple languages (English, German, French, Spanish ). More functions: I/M monitor readiness test; Easily determines the cause of the Check Engine Light ( MIL); Turns off the Check Engine Light and Retrieves vehicle information (VIN, CIN and CVN). This car troubleshoot code reader is certified by RoHS, CE & FC and supports ALL OBD II protocols: CAN, J1850 PWM, J1850 VPW, ISO9141 and KWP20000. Portable vehicle diagnostics tool (4.25*2.91*0.79 inch) no batteries needed-powered via detachable OBDII cable. Perfect for DIYers and car owners. If you have any questions about this product by AUTOPHIX, contact us by completing and submitting the form below. If you are looking for a specif part number, please include it with your message.